Overcome the challenges of modern life and stay happy, focused, and energized! 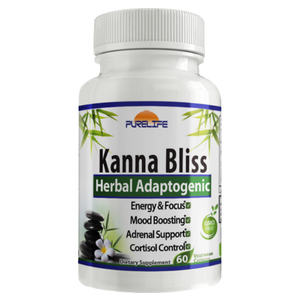 Kanna Bliss features the most scientifically backed adaptogens for a high-potency formula; wielding both immediate and long-term benefits. Rhodiola: May enhance energy, mood, and brainpower; and lower cortisol, depression and fatigue. Cordyceps: Support for autoimmune diseases and leaky gut; may have anti-aging effects and reduce inflammation. Bacopa: May boost memory, brain function, focus and learning (Helpful for those with ADHD); May help reduce pain, lower blood pressure, and regulate serotonin and dopamine levels. Ashwagandha: May support adrenal and thyroid health, lower cortisol, and boost mood. As a dietary supplement, adults take 2 capsules daily, or as needed. Kanna Bliss can be taken with or without food. WARNING: Keep out of reach of children. Not intended for those under 18 years of age. Kanna Bliss may increase sensitivity to alcohol. Do not drive or operate heavy machinery if consuming Kanna Bliss with alcohol. Consult with a physician if pregnant or nursing. Do not exceed 4 capsules per day.